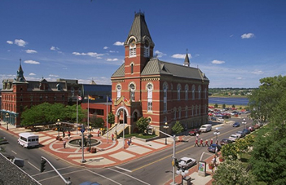 Indosoft is a Canadian Corporation incorporated and located in New Brunwick's Capital City, Fredericton. A 15 year old private employee owned technology company, Indosoft Inc., is the developer and global provider of Q-Suite, a robust, feature-rich, scalable contact center ACD software for Asterisk telephony. We also offer High Availability and Call Survival with Failover capability for Mission Critical Operations. Q-Suite Call Center ACD suite leverages the technology stack of Asterisk, Linux, Apache and MySQL to provide an open architecture platform with unsurpassed functionality required for next-generation IP enabled contact center technology platform, out of the box. Q-Suite, with many established sites around the world including U.S.A., Canada, Australia, Africa, Europe and Asia, is used in hosted solutions for Cloud deployment as well as on-premise installs. Its Linux and Asterisk platform make it the most cost effective solution for contact centers.